Every year we hear about it. Some new department store chain has changed the word Christmas to “Holiday” and instructed their employees to say “Happy Holidays” instead of “Merry Christmas.” The laughable example of the “Holiday Tree” comes to mind. I saw this in a supercenter a couple years ago. A “Six Foot Holiday Tree with Built In Lighting” was just $39.99+tax. It was hideous actually, but I couldn’t stop myself from chuckling out loud. Go to a typical department store and just try to find “holiday” decorations with an overtly Christian flare. Good luck! There may still be a few holdouts here and there, but for the most part, if you want Christmas decorations that focus on the Christ child, you almost have to go to a religious store to find them. If you do find a regular store that still sells Christian decorations, please patron them, and be sure to tell all your friends and family to do the same. We should be sure to reward those establishments that still honour the real reason for the season. In America this politically correct trend, toward the purging of Christ from Christmas, has been dubbed the “war on Christmas.” Americans seem to be obsessed with violence, and as a result, many new social trends seem to become a “war” on something. In this case however, the metaphor may be justified, because there really is a purging going on, and to those on the receiving end of it (Christians) it truly does feel like a war they’re losing. In truth, this metaphorical “war on Christmas” has been going on for a very long time, and I think it began decades ago with the hyper-commercialisation of Christmas. I remember working in a department store about a quarter of a century ago. (I say it that way just to give a perspective of how long this has been going on.) It was a popular arts and crafts store. It was December, so naturally we were selling all sorts of Christmas decorations. One night a finely dressed Asian woman and her children came into the store frantically looking for lights and decorations. Her English was good, but I could tell she was new to the country. I helped her find everything she needed. She seemed very concerned, that if she didn’t decorate her house as quickly as possible, she might be seen as disrespecting our culture or something. She had many questions about these decorating traditions which were very foreign to her. I explained to her that all the fuss was about celebrating the birth of Jesus Christ. Then she stopped and looked at me in the most astonished way. “Jesus Christ?” she asked. I explained the whole thing to her. She was amazed, and even more confused. She told me she thought the whole thing was about Santa Claus, and presents, and most of all -- being American! Now I bring up this true story to illustrate a point. What kind of message is our culture sending with all of this pomp and circumstance we do every December? This lovely immigrant I met twenty-five years ago had been looking at decorations go up for weeks and yet she made no connection to a religious celebration. If you ask me, that’s an indictment, not of her but of us, and especially our culture. This “war on Christmas” has been going on for a very long time. Long before “happy holidays” and “holiday trees,” our Christian culture surrendered our Christmas celebrations to the cult of commercialism. In fact, I would say this surrender began an extremely long time ago, way back in the early twentieth century. It started when retailers learnt that December was the biggest shopping month of the year, thanks to the popular Christian celebration of exchanging gifts on Christmas. So to generate more sales, they needed to promote the Christmas holiday, but to do that, they couldn’t get too religious. After all, Jews shop in December too, and so do atheists and non-religious people. Any overtly Christian message might drive those customers away. So immediately, there was an attempt to scale back the religious connections to Christmas, and an emphasis was put on popular folk tales and cultural mythology instead. It wasn’t long before Santa Claus became the focus of Christmas more so than Jesus Christ. Now this may seem odd, since Saint Nicholas was not only a Christian figure, one of particularly Catholic character, but it wasn’t the historical Saint Nicholas retailers were interested in promoting. Rather, it was some fabricated mythical character resembling the “jolly old elf” from Clement Moore’s classic 1823 poem “Twas the Night Before Christmas”. With the retail adoption of that particular version of Santa Claus, the commercialisation of Christmas was in full swing, and for quite a while, Christian Americans naively embraced it. As time went on however, promotion of Santa Claus simply wasn’t enough, and fears arose that any mention of Christ in Christmas might offend non-Christian shoppers. So then came the purging. Not only would the mythical Santa Clause be promoted, as well as all the other mythical characters that arose during the twentieth century, but all mention of the Christ child was to be gradually eliminated. Again, our American culture simply went along with this, not realising the full scope of what was happening. Then, roughly about ten to fifteen years ago, the unthinkable happened, and we finally hit the overreach of political correctness. Not only department stores, but public schools as well, stopped saying “Merry Christmas,” and substituted the term “Happy Holidays.” The holiday phrase had been used for a long time of course, in general public discourse, mainly to refer to Christmas and Hanukkah together, but now for the first time, people were being told not to say Christmas any more. Thus the metaphorical “war on Christmas” was born, and here we are today with our happy holidays, holiday trees and our festival of lights. Where is Christ in all of this? Well, he’s not in the department stores. That’s for sure. You won’t find him on the campus of public schools. Outside of very rare occasions, he’s not usually featured on television Christmas specials. Thankfully, we still have him on the radio, now and then, with some popular Christmas carols from ages past. However, with all the new pop artists releasing Christmas albums every year, I’m not sure how long that will last. Indeed, if we rely on retailers, governments, artists and broadcasters to keep Christ in Christmas, we’re done for. That’s the problem really. We Christians have been relying on others to fight our battles for us, and that is our undoing. These days I hear a lot of people bemoaning the commercialisation and secularisation of Christmas (er, I mean “holiday time”), but we fail to see that everything we need to win the battle is already in our hands. It’s time to stop cursing the darkness and create a light -- a big light -- one that will outshine and outlast all those inflatable yard ornaments. It’s really simple. Any Christian family can do it, and any Christian pastor can promote it. The solution draws heavily upon our Christian liturgical calendar, which is already familiar to many Catholics, Anglicans, Methodists and Lutherans. This will be new to Baptists, Pentecostals and Evangelicals, but they can catch on rather quickly. It’s called Advent and the Twelve Days of Christmas, or Christmastide. For our Christian brethren who might not know, Advent begins on the fourth Sunday before Christmas. So look at your calendar, find Christmas, and count back four Sundays. That’s the start of Advent. Now Advent is a time when we prepare for Christmas, just like everyone else, but as Christians, we should be making this a particularly religious occasion. For example; I don’t have a problem with mythical Santa, elves and flying reindeer. However, if our intention is to put Christ back into Christmas, than maybe we should leave the fairy tales in the attic and showcase the nativity scenes front and centre. On a personal note, my annual Christmas outdoor display is very simple. I put the Holy Family in the middle of my front yard, and surrounded them with little spiral Christmas trees. That’s it! It’s nothing fancy, but it definitely gets the point across. There is no way anyone can drive by my house and not know that Jesus Christ is the reason for our celebration. Multiply a display like this by a several million, and don’t tell me it wouldn’t have some kind of impact on our culture. It would. So when you’re putting up those Christmas lights, think about this. How can you tell your neighbours, and everyone who drives by, that Jesus is the sole reason for the season? Then of course there is the Advent wreath. Every Christian home should have one, or at least four Advent candles, to light one for each week, until all are lit. Children love this custom, as it serves as a visual countdown to Christmas. Every candle lighting session in the home should be accompanied by the song “O’ Come Emmanuel” to remind everyone in the house what this season of Advent is about. The word Advent means “coming” and it is a Latin translation of the Greek word Parousia. During Advent we contemplate Christ’s two comings. At the First Advent he came to us as a babe in a stable, to save the world from sin. In his Second Advent, he shall come to us in the clouds as a conquering King to judge the world and bring us into eternity. This is a side of the Advent season sorely neglected in our modern age, and needs to be brought back. The song “O’ Come Emmanuel” has a haunting double meaning when Christ’s Second Advent is considered, with the understanding that the Church as the “Israel of God” (Galatians 6:16). Advent calendars have also become popular in recent centuries. These usually start on December first and end on the twenty-fourth. Children love them, as again, they serve as a countdown to Christmas. As Christians, we should be particularly careful to get Advent calendars with a religious theme. Some Christians observe Advent with mild fasting and abstinence. While this is not an official practice, it is observed by some, and of course there is nothing wrong with that. Others prefer to look at Advent as a time of increasing joy and expectation. Certainly this is the case with most children. I prefer the latter approach. But one thing Christians should be mindful of is a slowness and tranquillity in our Christmas preparations. This is so completely opposite of how things usually work. One of the ways my family deals with this is by getting all the big things out of the way first. Shopping is done early, the earlier the better. Avoiding the chaos of department stores and supercentres is a must for me. Christmas decorations go up immediately after Advent begins, so I’m not trying to rush them later. Wrapping of gifts happens early too, usually weeks before Christmas Day. Everything is done as early as possible to reduce the Christmas rush, and try to enjoy the time of Advent for what it is. 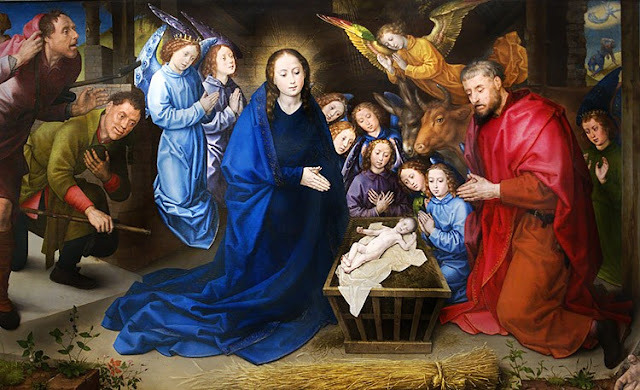 Advent is supposed to be a time of peaceful preparation for the coming of Our Lord, wherein we remember his first coming as the babe in a stable, and look forward to his Second Coming as our King in the sky. It is so important that we project to the world an atmosphere of peace and tranquillity. Our celebration of Advent and Christmas should be a joyous one, completely disconnected from the hustle and bustle of the commercialised “holidays” put forward by retailers, governments and broadcasters. Now get ready because Advent is just the preparation. I’m about to tell you how to strike a death blow to the metaphorical “war on Christmas.” This is how to do it. Prepare and then STOP. That’s right, I said, “Prepare for Christmas and then STOP.” Don’t go any further. There should be no Christmas parties prior to December 25. There should be no carolling prior to December 25. Once everything is ready, STOP and enjoy the lights, music and candles until December 25. Then, on Christmas Eve (the evening before December 25) GO! -- the partying begins. Not only does it begin on December 25, but it shouldn’t stop until January 6. Here is why. Christmas is not a day. It’s a period of time lasting twelve days. It starts on December 25, which is the Feast of the Nativity, wherein we remember the birth of Christ and the visit by the shepherds. Then it goes through until January 6, which is the Feast of the Epiphany, when we remember the visit of the magi (wise men). Now stop and consider this. The commercialised Christmas (holiday) ends on December 25. By December 26 it’s over. So long as Christians celebrate Christmas this way, the commercialisation and secularisation wins. The way to gain victory over the “war on Christmas” is to keep celebrating long after everyone else has stopped. So get as many recordings of religious Christmas music as you can, and keep them playing through January 6. Call those Christian radio stations, playing Christmas music in December, and nicely tell them if they’re really “Christian” they should keep that Christmas music going through January 6. Keep all the decorations up, and for heaven’s sake, don’t turn out those Christmas lights! Keep them going! Instead of having one giant dinner on Christmas Eve with the whole extended family, maybe consider two or three (or more) Christmas dinners, at various houses, during the twelve days of Christmas. Share the cooking and hosting you see. Then get religious! Attend church services more often during Christmastide (the twelve days of Christmas). This is the time for carolling, parades, pageantries and parties. Churches can organise a lot of these things. If pastors begin working together with other pastors, across denominational lines, they can begin community pageants and parades with a strictly religious theme. The New Year celebration can take on a much more traditional religious tone. While many Christian families can break up their gift-giving into two parts. Some gifts on Nativity (December 25) and some gifts on Epiphany (January 6). Retailers can control what they put on their shelves, and what they tell their employees to say. Schools and government offices can do the same. None of them, however, can control time. That is something we Christians have on our side. The commercial and secular “war on Christmas” has a flaw. It’s an Achilles Heel that we can easily exploit to our advantage. Santa Claus only comes on Christmas Eve. In other words, the whole commercialisation and secularisation of Christmas is dependent on everything coming to a close on the morning of December 25. Whatever happens after December 25 is beyond the control of retailers and government institutions. If Christians will simply reclaim the historical celebrations of Advent and Christmastide, which rightfully belong to them anyway, victory over the “war on Christmas” will be inevitable. We can’t stop the commercialisation and secularisation of Christmas, but we sure can render it irrelevant. Shane Schaetzel is the author of Catholicism for Protestants. He blogs at catholicozarks.blogspot.com. A blog of apologetics and random musings from the Bible Belt.